As a classic-and classy-drink, nothing rivals the martini. It was the favorite of Churchill, F. Scott Fitzgerald, Hemingway, Cary Grant and, of course, Mr. shaken-not-stirred himself, James Bond. After a few decades overshadowed by the piña coladas of a glitzier age, martinis have made a big comeback. They’re now one of the top five cocktails requested at bars. 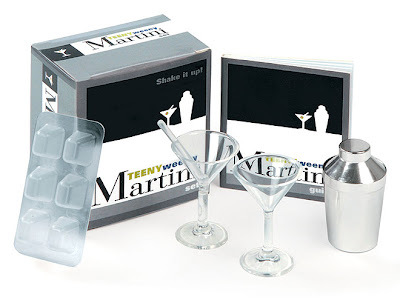 Their kit includes everything you need to make a teeny-weeny martini: a mini metal shaker, ice cube tray, 2 martini glasses, and 2 stirrers. Just add a tiny airline bottle of alcohol and you’ll have a drink that, despite its size, really measures up.